During my Project I decided to improve upon the little hitch bumper I found last year. And it would just look funny if I hadn't redone the trailer hitch itself, which was rusted and covered in undercoating. I started out by cutting the old hitch bumper/step off so I just had the insert that fit in the hitch. I then found some metal in the garage and made a frame that went around the license plate. I had to be careful when designing this so that the tailgate could still open when the piece was on the vehicle. Once I made some pieces I tacked it up. Once I had achieved a good piece I liked, I finished fully welding up the metal. After the welding was done, I ground down the welds so that they were flush with the rest of the metal. I could have sanded them further down and made then really nice, but it is a winter truck and they will rust eventually. After the metal was done I sandblasted the frame, this was pretty quick compared to sandblasting the trailer hitch, and it was amazing compared to the aluminum rims. After it was cleaned up I sprayed it all with a coat of primer and set it to dry. Once the primer had dried, I shot the hitch and insert with the black paint to match the rims and set it aside to dry. after giving it an hour or two to dry, I took them up to Techshop and baked the paint in their powdercoating oven. Curing the paint in their oven dried it quickly so I could put them on the truck the next day. Paint takes a full 30 days to cure completely, even longer in cold weather, Techshop allowed me to cure them in about an hour. Nice work! I am curious to know if you are at all concerned that your square tube frame will bend if someone were to hit it, even fairly lightly? 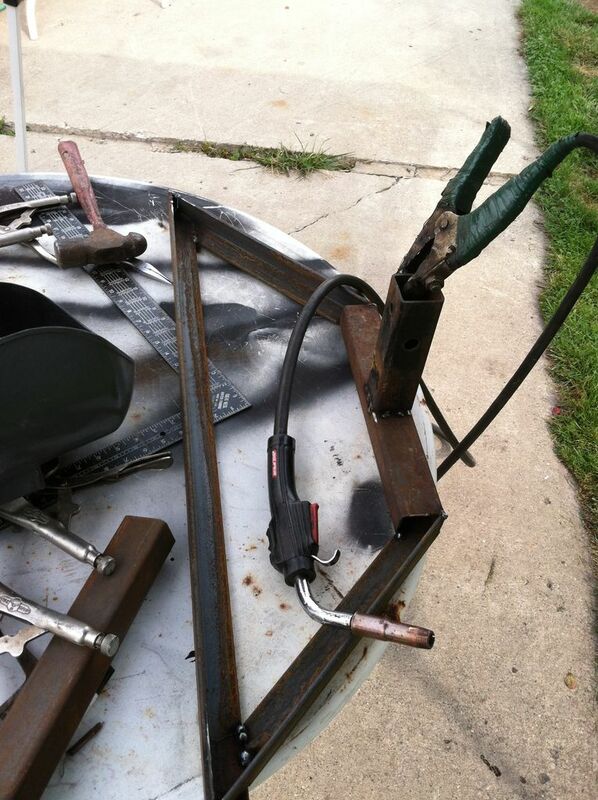 All the impact torque would be on the welds to the hitch insert. There are hitch inserts similar to the one you replaced, with some sort of shock absorption capability that reduces shock to the vehicle. I am looking to build something like that for my F350 4x4.